Five Finger Death Punch’s cover of Kenny Wayne Shepherd’s “Blue on Black” just got a major makeover. The Las Vegas hard rock band has added a bevy of legendary names to their cover of the 1997 blues rock hit, which makes for a lively recording. The new track features iconic guitarist Brian May of Queen and guest vocals from country singer Brantley Gilbert and Shepherd himself. The just-released cover of “Blue on Black” is available for download now at digital outlets. 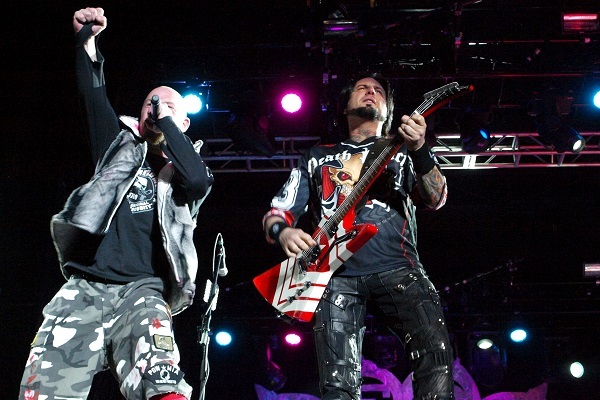 Five Finger Death Punch has also unveiled an official music video for the track, which can be viewed below, and the clip features May, Gilbert and Shepherd. The video shows footage of police officers, firefighters and first responders, and all the of proceeds raised from the new cover song will be donated to the Gary Sinise Foundation to help military veterans, first responders and their families.